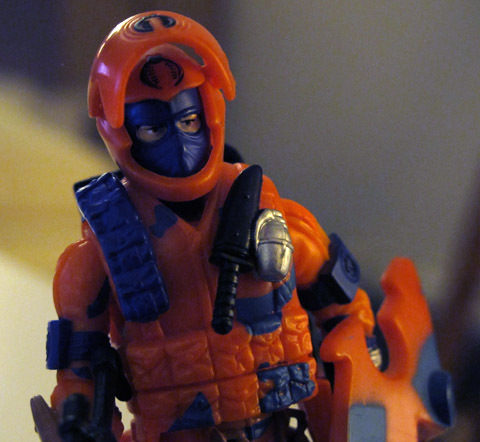 Remember how I used to write about toys occasionally? Actually, remember how I used to write about things occasionally? Becoming editor-in-chief of 1UP really quashed the contents of this site — not only was I super-busy, but I also felt like just about anything I created (save the collective books) needed to go on 1UP to do everything possible to shore it up against the looming specter of death. Since that didn’t make a difference in the end, and now I’m attached to a site where a ton of people are teaming together to create content daily, the pressure’s off. I’ll be writing plenty at IGN, but now I won’t feel sick to my stomach any time I write something here. While there aren’t a lot of upsides to what’s happened with 1UP, I guess I can take some small comfort in this. So: Toys. I don’t buy many these days, because of a lack of money, space, and immaturity. Really, for the past few years, the only toys I’ve really collected have been the 25th anniversary (and subsequent lines of) G.I. Joe figures. At this point, though, just about all the classic characters have been captured in modern style, and the only way to pick up the stragglers is through expensive subscription services and ludicrously hard-to-find convention exclusives. So, screw that noise. I have just about all the ones I actually care about, such as the wonderfully garish Alley-Viper. I remember seeing the original Alley-Viper when I was in junior high school and had long since given up toys; I went over to a friend’s house and laughed to see that he hadn’t. Not in a mocking sort of way, just a laugh of surprise. “You still buy G.I. Joes?” I asked. “Only a few,” he said, “and only when they’re really cool. Like this guy.” He waved the Alley-Viper in my face. I rolled my eyes at a figure that was totally soaked in the garish neon colors that made me lose interest in the line in the first place. But then I looked closely and realized… it really was a nice toy. Detailed, colorful, interesting, unique. I was really happy when they finally managed to get the Alley-Viper into the anniversary line; with modern design and manufacturing methods, the current-day rendition of the character is absolutely brilliant. 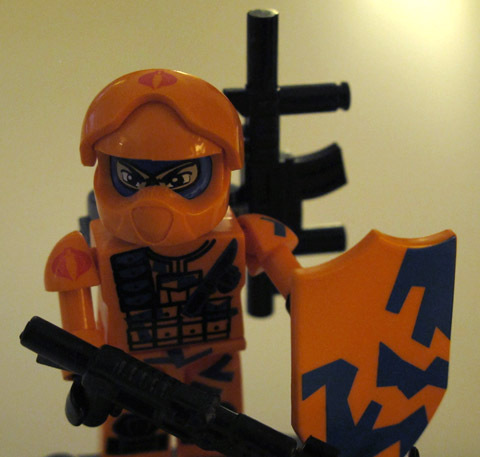 And I think I’ve mentioned this before, but I better understand the neon orange now: The goal of this soldier’s camo isn’t to hide but rather to be seen. They’re urban occupation troops, heavily armored soldiers present not to fight wars but to suppress civilians. Their mere presence — broadcast by those insane colors — pacifies citizens. A nice bit of realistic detail in a toy line that features fake superhumans made from the DNA of millennia-dead conquerers. An Alley-Viper rendered in KRE-O form. KRE-O, it turns out, is Hasbro’s LEGO rip-off, with pegs and holes that work with LEGO blocks. Fittingly, the characters do for building-toy minifigs what G.I. 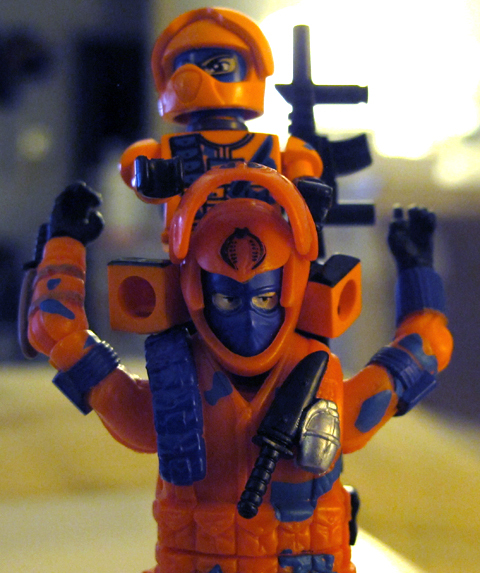 Joe did back in the ’80s to the action figure scale made popular by Star Wars toys. They’re the same size, but vastly more detailed and insanely more poseable. I have no idea why they decided figures that stand less than two inches tall need ball-and-socket shoulder and hip joints as well as a swivel waist, but there you are. The whole line is great, but unsurprisingly the Alley-Viper is the star of the line. 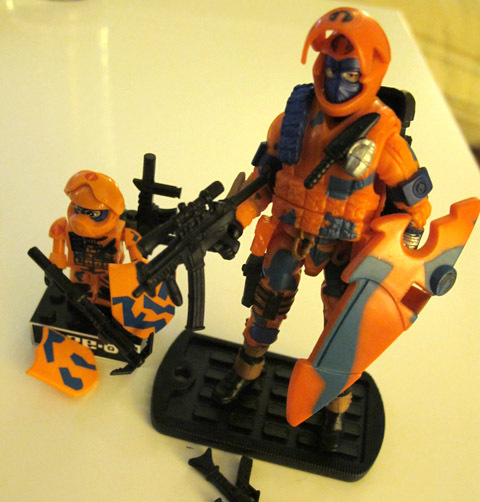 He comes with two guns (a rifle and a gas-powered grappling gun), two different shields, a helmet with moveable face shield that goes over his balaclava, and a backpack that lets him store away his disused weapon. I’m very sorry that my newfound freedom to blog more has resulted in something so inane. This entry was posted in Toys and tagged alley viper, g.i. joe, kre-o. Bookmark the permalink. I’m not sorry! I hope to see more stuff like this! I love all the video game talk, of course, but posts like this are more than welcome by me, as well. Alley Viper always was my favorite as a kid. Sure, the colors didn’t make sense, but the shield and helmet were so cool. Looking at that new take on him, they still are. ‘Twasn’t inane at all, it was! We’re roughly the same age, so seeing your words regarding the trends of our childhood brings slight warmth to my cold, dead heart. Keep it coming! I agree! I look forward to more of this kind of stuff. Feel free to filter all of that excess 1UP stuff here! Posts like these are the reason I started reading the internet. A++ would read again. Ah, this is the sort of thing I’ve missed around here! Also, Kit-Kats. Yeah, I have to admit I never really got into Joe, but I too welcome the return of random nerd miscellany to the front page of Telebunny(…Spite…Frog). Man, I loved G.I. Joe and Transformers as a kid. I didn’t even get to watch the cartoons much! I can literally count the number of episodes I got to see on one hand. Didn’t matter, ’cause the toys were cool, and that’s the important part. The KRE-O blocks are pretty cool. I picked up a couple of Transformers sets the other day in a salvage store. Definitely a blast from the past. Yay – inane Parish writings! !